The sample stack includes every rugby-focused supplement in our range and comes in an awesome carrying stack by BlenderBottle. Our sponsorship program means your rugby club gets $2.50 when you buy the Sample Stack. Find your club’s code. Want to try all 5 of our nutritional supplements before you throw down for the full stack? Now you can with our sample supplement stack. PLUS – you can keep the GoStack (RRP $13.00). Our sample stack gives you the chance to try all five of our custom, rugby-focused supplements. Find usage instructions on each of the individual product pages. 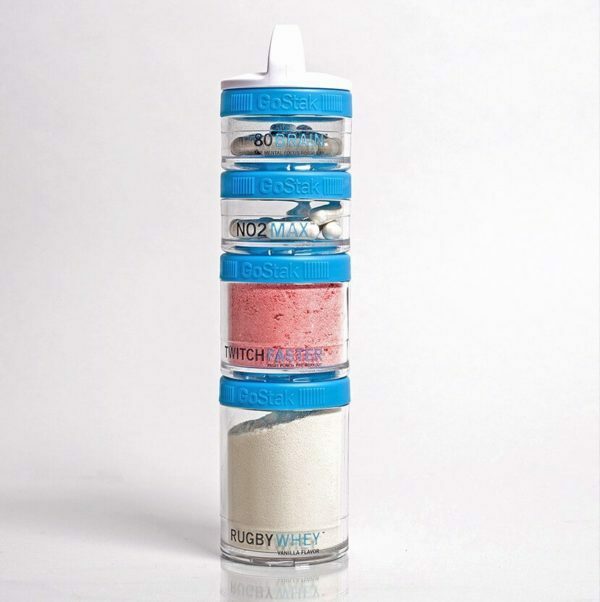 And keep the GoStack by blender bottle with our compliments! Pre-Game is a potent pre-workout powder. Boost your energy levels without the crash. Ideal for use during rugby games and training. Add a single scoop of Pre-Game to 16oz of water about 20 mins before rugby games and training. Post-Game is the first supplement designed for use after rugby games. Contains optimal amounts of BCAAs, Creatine & Electrolytes for recovery. Optimize your recovery by taking Post-Game within 30mins of finishing rugby games or gym sessions. NOxide is an L-Arginine-based endurance supplement that may deliver nitric oxide to your muscles and keep you performing at a higher intensity for longer. Our product team recommends using it before rugby games and just before bed the night after. Our original rugby-focused supplement, 80 Brain was designed to provide a cognitive boost on the rugby field. The formula includes ingredients shown to enhance memory, reasoning ability and decision-making. Rugby Whey protein powder is designed to decrease your recovery time and leave you feeling fully recovered after rugby games. Repair muscle damage, recover from weight training and build lean muscle with the only whey protein made for ruggers.